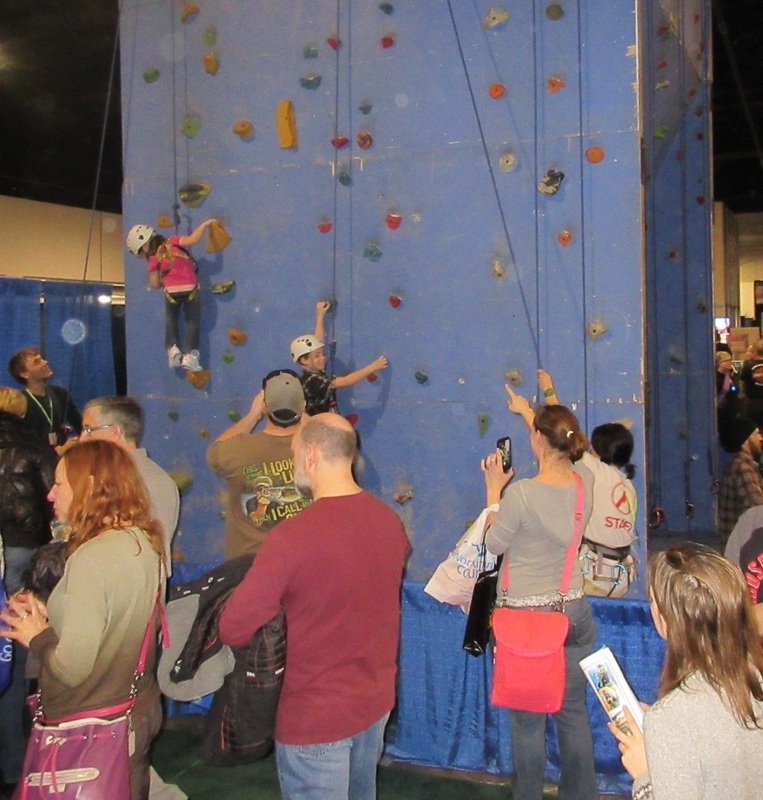 Fresh back from the 2016 Outdoor Adventure Show in Toronto, I can report the attraction was designed with young families in mind and it really is a great place for Heads-Up Dads to spend Saturday with the kids. It’s cost effective too. Adults pay $14, and children age eleven and under get in free. There’s no sandbox, bumper cars or bouncy gyms here, and no food courts either, but the whole show is something of a play zone with every vendor offering up something cool for young people. 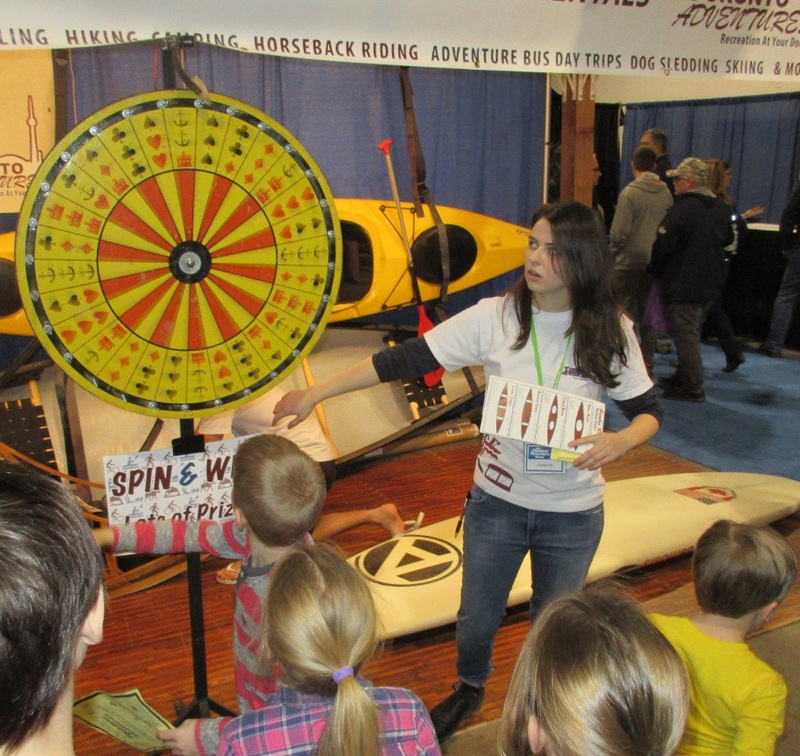 The three-day exhibition has a wide array of adventure options for all age groups right there on the trade show floor. Many booths have interactive games for 8-12 year olds, mostly puzzle challenges; smart dealers know they need to tie up young family members so they can talk shop with parents. 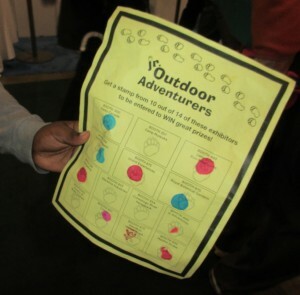 The show’s organizers had young families in mind when they created the Outdoor Adventurers Passport wherein kids can collect stamps (paw prints) from vendors for prizes at the end of the journey. A completed passport could be turned in for both short term rewards and a chance of winning a much bigger prize later. The true benefit is for vendors of course as this tactic effortlessly draws in families with young children; this passport is an ice breaker with an easy greeting ritual and friendly exchange that makes it real easy to talk afterwards. Everywhere I looked there were young people getting their adventure on; they were climbing rock walls, and in one corner of the show kids were zip lining between platforms overhead. In this respect young people acquired a different perspective on the event than their parents. There were a couple Crown & Anchor wheels which had been repurposed into spin-the-wheel games for coupons. The one on the right was operated by Tourism Toronto and dispensed SUP vouchers, gift certificates, coloring books and there was almost always a crowd of youngsters in front of this rig. But the real pedestrian crush occurred in the main aisle just inside the front door where it bottle-necked around the Flight Center and a hot deals travel agency. If you were shopping for discount airfare for your next family trip then this was probably a good place to be. Regarding the crowd I think what happened was the new people coming in the door came up against the folks who’d been around once already and everyone jammed up on Main St there in front of Xcitelife. 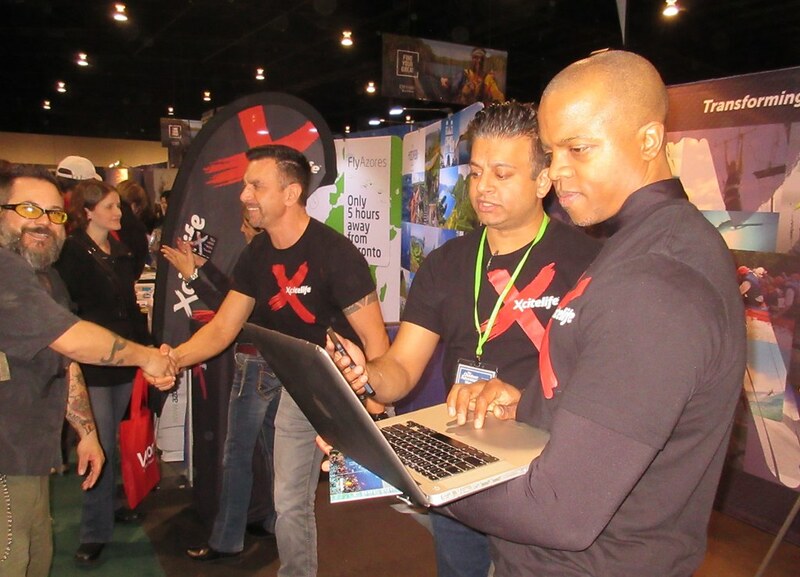 People could not get down the center aisle without encountering a list of fun things to do at Xcitelife; the booth attendants wore black shirts with red X’s. This is the company motif and the X stands for experience and not extreme. Their charismatic greeters stood near their company flags drumming up excitement for their experience marketplace and they signed up many influential new users. 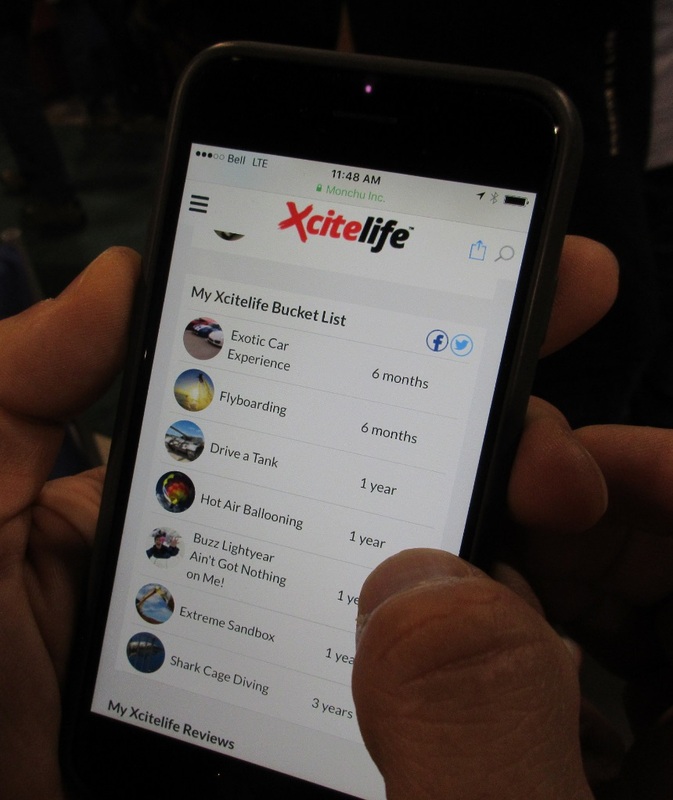 Xcitelife asked families to make a Bucket List; their software helps decision makers source travel solutions in the coming months and years. Check out Earth Girl and another great profile from the show is Martin, The new members wrote their aspirations on red paper X’s which they pinned to a dream board. The board soon displayed the collective vacation fantasies of the entire show and it was from this arena that a prize winner was eventually selected. There was no food court, but there was protein available at the show. Kids love cured meat! 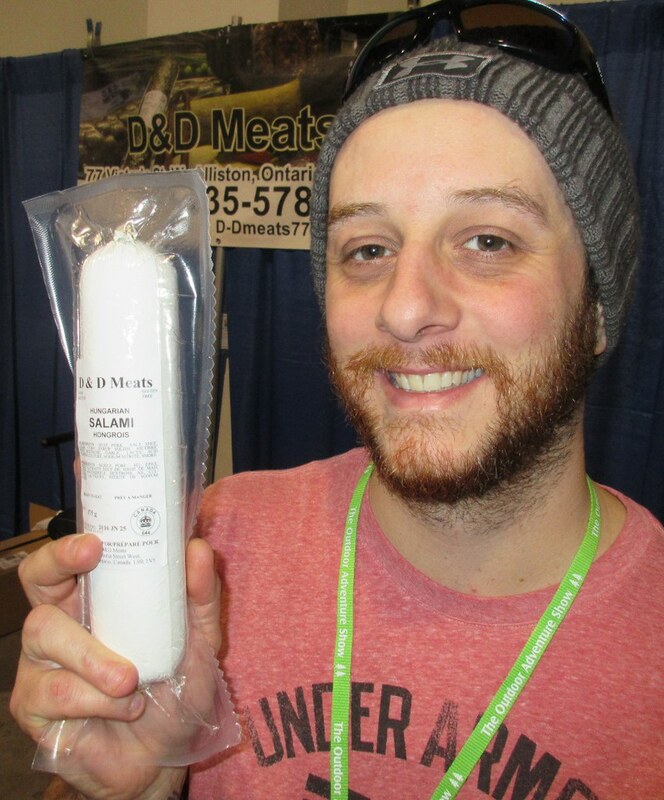 D & D Meats were among the only food vendors at the show. There were granola bars and trail mixes in the survival quadrant, but this booth was the only meat option. This family-owned cured meat shop from Alliston Ontario had a wide corner all to themselves, and were doing a brisk business selling beef jerky, pepperoni, sausages and kielbasa. All day long people streamed through the crowded event eddying about in open areas of the trade show floor and milling around the central water pool. This aquatic attraction was also called the Demo Pool and frequently had young performers showing off their skills in the latest model kayaks. The crowd also collected in front of three live theatres where experts shared stories and advice. This author came upon the Adventures in Paddling stage just as the float plane touched down on Rabbitkettle Lake on the Nahanni River and a flat water paddler unpacked stand-up paddle boards for the whole family. Rapid Media Best Kayak Reviews 2016 Paddling Buyer’s Guide, also SUPs, Canoe Reviews. 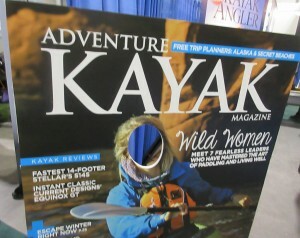 Adventures in Paddling theatre was surrounded by the latest model SUPs or Stand Up Paddle Boards, canoes and kayaks for sale, and on the far side of the opening stood the Rapid Media booth with giant posters displaying their magazine titles. 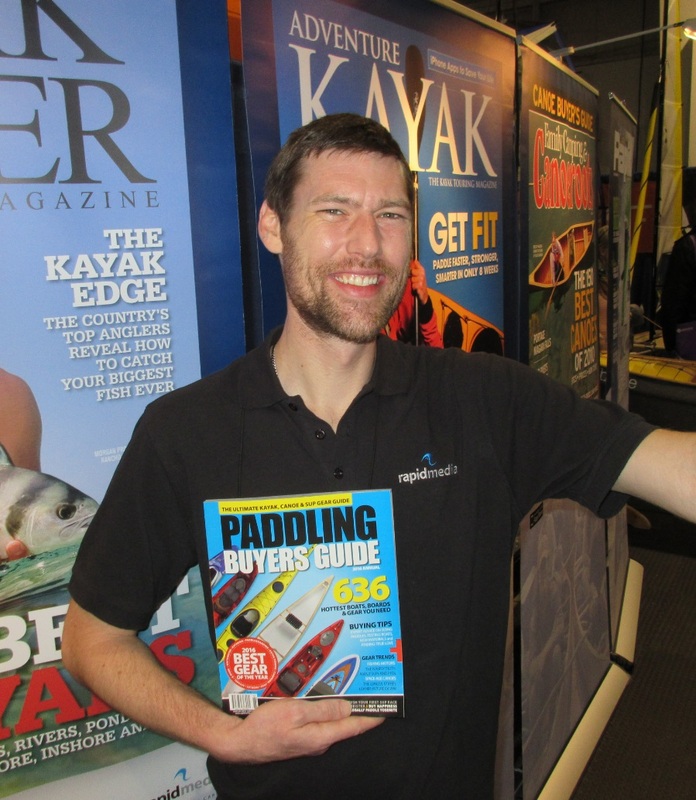 Elijah Liedtke pointed out the 2016 kayak reviews and then he gave me an insider link to the online kayak reviews, paddling buyer’s guide. which is free and considered one of the big secrets of the show. 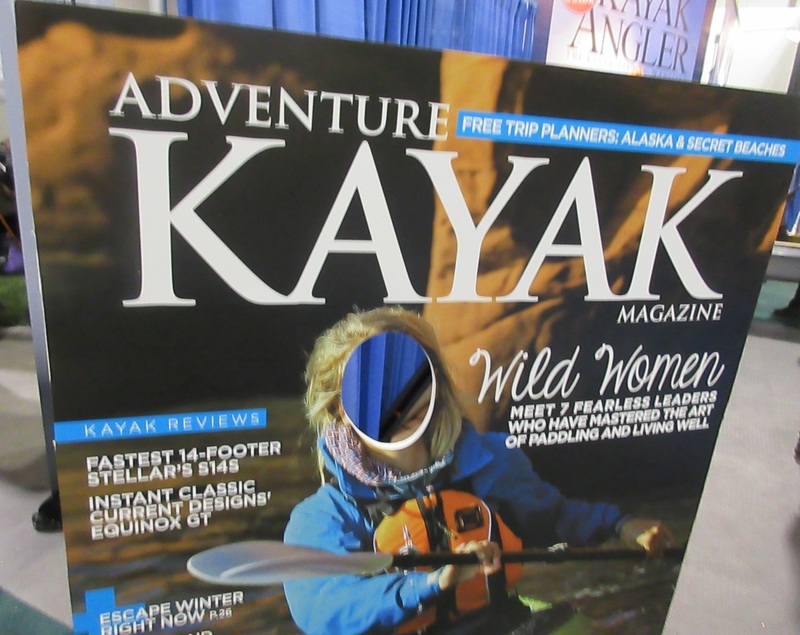 Rapid Media has done well in the paddling space with four popular magazines, Adventure Kayak, Canoeroots, Kayak Angler, and Rapid the whitewater magazine. These publications are gorgeous print mags filled with real life travel stories, photos, videos and professional gear reviews from expert paddlers all over the world. At the show the editorial staff were selling half price annual subscriptions. Each of the three live theatres was sponsored by one magazine or another, and besides the paddling magazine one was dedicated to scuba diving and another to hiking; and the land trekking theatre was sponsored by Outpost Magazine, which is all about getting geared up and making long distance journeys across vast scenic landscapes. 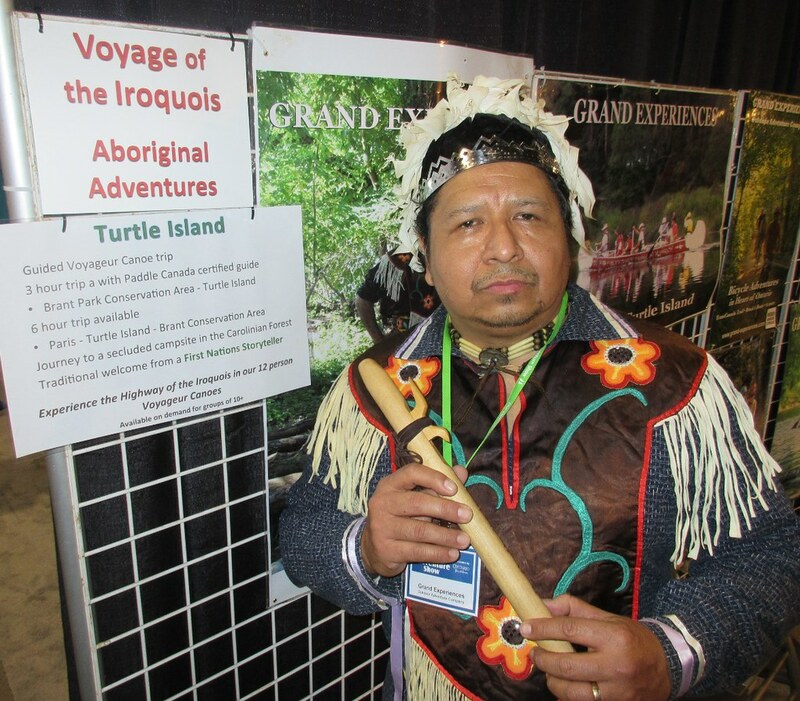 First Nations storytellers enthralled kids by relating the Voyage of the Iroquois. The area attendants were dressed in native Canadian regalia, and the walls of their particular open attraction were filled with images taken by passengers inside the giant twelve person canoes. These pictures are from summer trips that spend two or three weeks paddling the historic trade routes of the Voyageurs! 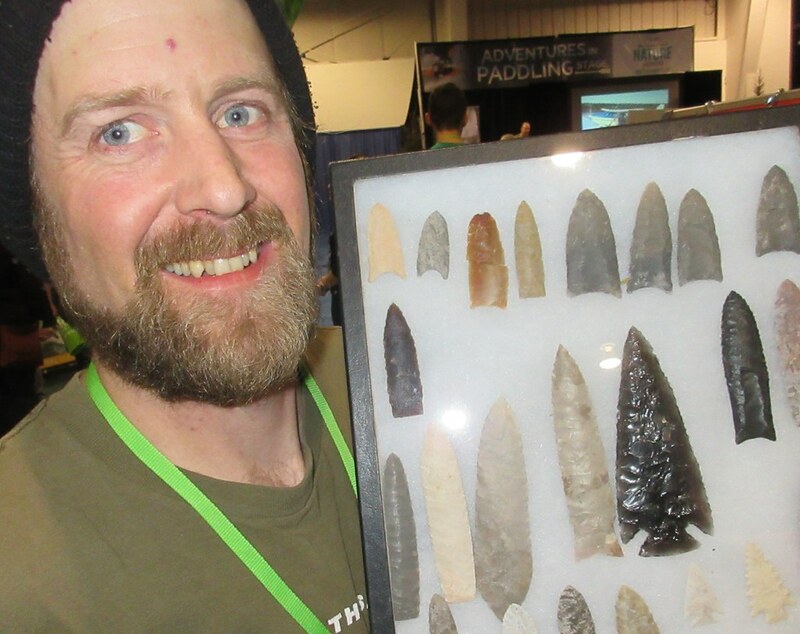 Kids could indeed soak up a lot of history from the installations at the show, and at one exhibit in particular there was displayed stone axe heads, arrowheads and spear points from the Stone Age. At noon in the Survival Theatre on Saturday there was an expert from Parks Canada who was able to show crowds how the First Canadians could hunt and kill great beast with primitive weapons. One guy seen below actually assembled arrows and spears in front of a live audience. 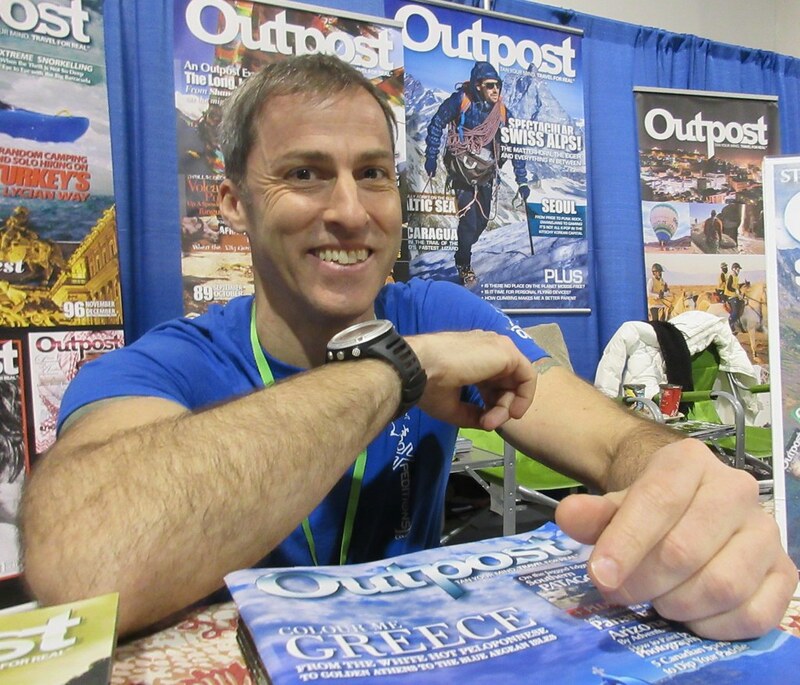 Kids of all ages love the Toronto Adventure Show and the best part are experts like this guy who share first hand knowledge. This is a family show that’s fit for outdoor adventurers of all ages – more information about the 2016 Outdoor Adventure Show on Toronto Guardian.